It’s 3 o’clock in the morning and I’m staring at the wood-paneled ceiling in my hotel room in Banaue, Philippines, wondering how long the earthquake that’s shaking me awake will last. A million things can go wrong on this adventure. The earthquake could cause a landslide, which would block the narrow road and halt our journey. Or, at 101, Whang-Od could be sick, tired, or taking a day off, an occurrence that’s becoming more frequent, understandably, at her age. It’s also possible that we’ll get all there, and Whang-Od has a waitlist that spans the length of days. During high season, it sometimes takes three days or more to be seen by her, forcing travelers to either spend a few nights in the village or give up and head home. Despite what could go wrong, all of these risks are work taking as I embark on my trek to meet Apo Whang-Od. Whang-Od is the last living mambabatuk, upholding a tradition that has spanned centuries. She’s received accolades and worldwide press and has been the subject of documentaries featured on BBC and CNN. Like the start of most of my favorite travel adventures, I first heard about her from a local named Glenn, who owns a small dive resort called Azure Dive on the island of Dumaguete. He’s right. Depending on who you ask, Whang-Od is either 98 or 101 or 103. No one is certain of Whang-Od age, and there are no official documents confirming her birth. 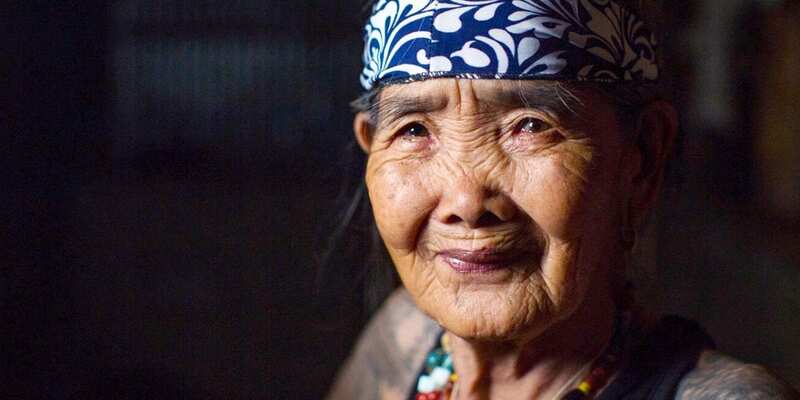 Her 80+ year career began when Whang-Od was a teenager tattooing headhunters and warriors from her tribe, the Butbut people, who would earn their ink after killing to protect their community from enemies. Over the years, her work became internationally recognized, leading to the prosperity of her village. As a community, they now have more advanced means of farming, for example, and a paved road that leads to the trailhead of their town, which sits high atop a mountain of rice terraces. Whang-Od works with the same traditional designs that have adorned her tribe for centuries. She doesn’t do custom work, and still uses a pomelo thorn as a needle and soot from her cooking pot as ink. For me—a woman that’s already heavily tattooed—making the 12+ hour journey to see Whang-Od is simply an honor. She’s more than an artist, Apo Whang-Od is a role model for women who choose unconventional paths. In small communities like Buscalan, village women are traditionally married at a young age, some as young as 14 or 15. In her early days, the 1920s, it would’ve been common for Whang-Od to have been married off to a village leader or headhunter as young as the age of 12. But she never married. And she never had children. The day I meet Whang-Od, she’s wearing bright pink floral pants, a tie-dye bandanna and a black t-shirt of a Filipino pop star that hangs loosely on her roughly 100-pound frame. She’s got on gold hoop earrings, a thin gold bracelet, and a diamond ring that she rolls around on her index finger. Her arms are completely tattooed and she’s dressed impossibly cool, with a humor and a grace about her as she moves through the cabana quickly. It’s hard to see how anyone could not become enamored with her. I watch her take a photo with a younger Australian tourist after completing some artwork on his leg. She smiles wide for the camera, then reaches over and grabs his crotch, cackling. 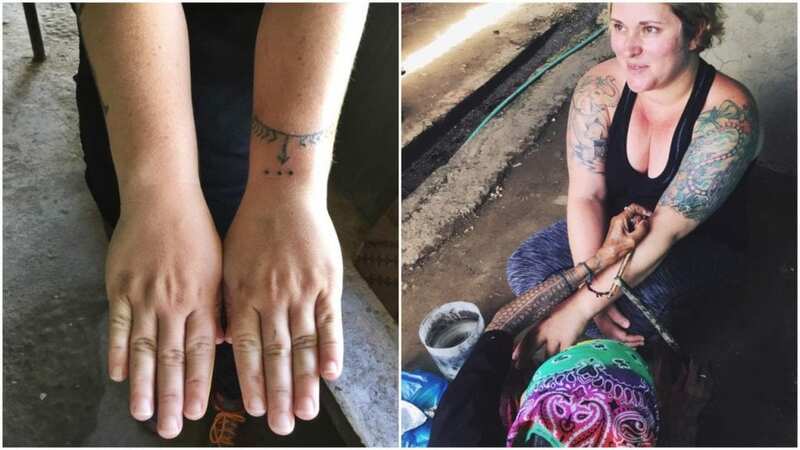 When it’s my turn to get tattooed by her, I sit on an overturned bucket on the cement ground in front of her nervously, while she draws with pine soot on my arm. I want to tell her how much I respect her, how the 12-hour drive and two-hour trek was worth spending this time with her now. 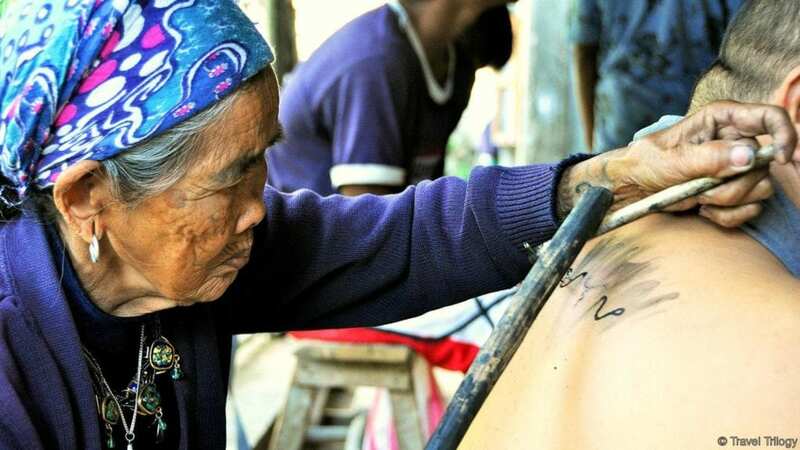 Instead, I say nothing, the pain taking my words away as Apo Whang-Od starts tattooing me. She keeps her gaze focused solely on my tattoo, except for when she moves her head to spit straight over my left shoulder, or when she notices a chicken running around behind me. Finding Apo Whang-Od isn’t easy, but that’s part of the adventure. To get to her village of Buscalan, you must first find your way to the province of Kalinga. The easiest way is via Bontoc, the nearest large town. If you’re coming from Manila, you’ll need to take the night bus to Bontoc, a 12-hour journey. From Bontoc, it’s another two hours to the start of Buscalan, via a jeepney, hitchhiking, or a private vehicle. From there, you’ll have to walk or hire a motorbike to take you to the start of the trail, where you’ll need to hire a local guide (1,000 Philippine pesos) to help you hike up the mountain to Buscalan and put you on her wait list. It’s a tough climb made almost entirely of vertical stairs that wind through rice terraces, but once you’re through it, you’ll reach a small thatch-roof cabana where you’ll find Apo Whang-Od, as well as her two grandnieces, Elyang and Gracia, who she is training to tattoo. If you’re arriving later than 10 a.m., don’t expect to be tattooed that same day. By the time you join the queue, choose your artwork and down a few cups of Buscalan’s famously rich mountain coffee, it could be well into the afternoon when your number is called. In other words, sit down, shut up, and prepare for a thrill that can only come from the pain inflicted by a tiny 101-year-old lady with a thorn and wooden hammer. 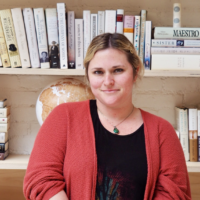 An entrepreneur at heart, Kelly Lewis is the Co-Founder and Executive Editor of Unearth Women. Kelly is also the Founder of Go! Girl Guides, the founder of the annual Women’s Travel Fest—a sold-out consumer travel event for women who love to travel—and Damesly, a tour company for professional and creative women.